What Day Of The Week Is August 25? 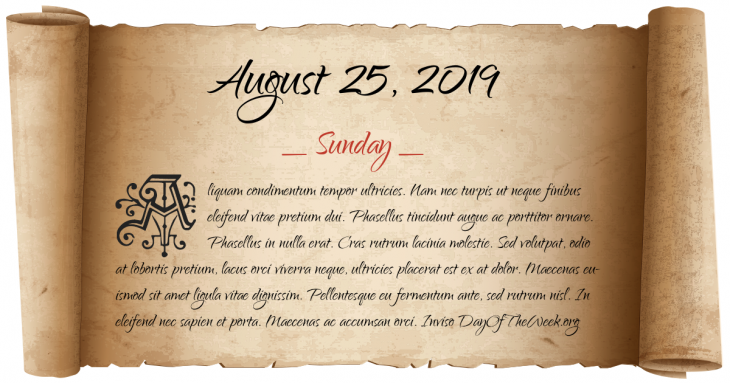 August 25, 2019 is the 237th day of the year 2019 in the Gregorian calendar. There are 128 days remaining until the end of the year. The day of the week is Sunday. Battle of Alcântara. Spain defeats Portugal. World War I: The library of the Catholic University of Leuven is deliberately destroyed by the German Army. Hundreds of thousands of irreplaceable volumes and Gothic and Renaissance manuscripts are lost. World War II: second day of the Battle of the Eastern Solomons. A Japanese naval transport convoy headed towards Guadalcanal is turned-back by an Allied air attack, losing one destroyer and one transport sunk, and one light cruiser heavily damaged. Ten days after World War II ends with Japan announcing its surrender, armed supporters of the Communist Party of China kill Baptist missionary John Birch, regarded by some of the American right as the first victim of the Cold War. Who were born on August 25?